I can’t believe another season has passed us by, and Easter will be here soon! Leighton and I just got done taking some pictures together this spring, and it made me think about Easter outfit ideas. I’ll be spending this Easter at church and with family eating lunch, so of course I have to have on my Sunday best! 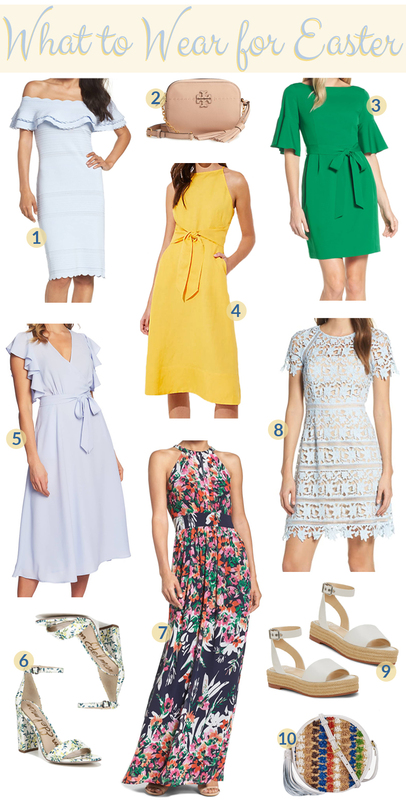 I’ve linked some of the dresses I’m thinking of wearing. What about you? What Easter outfit ideas do you have in mind? What will you be wearing for the Holiday? Fingers crossed that’s it’s warm and not rainy Easter weekend! Loving these Easter outfit ideas? Click here now for some cute Easter gifts! All the pieces you listed are gorgeous! The baby blue off the shoulder dress might be my favourite, it looks so pretty and flattering. So many cute dresses! I love the yellow one!! So many cute dresses! I love the yellow one! I love that off the shoulder pastel blue dress with those sam edelman heels! So pretty! I love all the dresses! The green dress is my favorite because the sleeves come down longer and I don’t like my upper arms to show! Love all these beautiful spring dresses! These outfits are so cute and great inspo!! Loving all of these dresses! That maxi Dress is gorgeous! Actually all the dresses are! Great picks! Love all of these options, especially the pastel ones. So perfect for Easter! Number 7 is my dream dress! And those Sam floral heels!? So pretty. So many pretty picks! Dressing up for Easter is always fun, especially when adding pretty colors into the mix! Those powder blues are SO perfect! Love the lace and ruffle details!